Laurence Juber Premieres Acoustic Arrangement of The Beatles' "And Your Bird Can Sing"
Today, GuitarWorld.com presents the exclusive premiere of Laurence Juber's new acoustic arrangement of the Beatles' "And Your Bird Can Sing." Laurence Juber—a Grammy-winning guitarist and former member of Paul McCartney &Wings—will releaseLJ Can't Stop Playing The Beatles! on March 3. 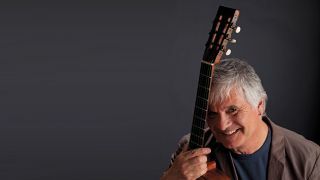 Outside the Box — Exploring Acoustic Guitar with Laurence Juber: What's the Score?